As an ever higher percentage of infrastructure projects use Building Information Modeling (BIM), many in the industry are realizing they need to embrace BIM to compete and win new work. A range of appealing benefits accompany projects that use a BIM-based approach: less rework, fewer errors, enhanced collaboration, and design data that can ultimately be used to support operations, maintenance, and asset management. Owners of civil infrastructure, including government agencies, don’t want to miss out on those benefits, and they are increasingly mandating the use of BIM on their projects. Despite the buzz around BIM for infrastructure, there’s still a significant amount of confusion about what it really means to “do BIM.” Engineering firms and organizations considering moving to BIM often wonder about the best way to implement it. Some worry about how much BIM will change their established processes. Others are hesitant—or they perceive themselves as too busy—to invest time to implement BIM. A few in the industry may even think they already use BIM, but, in fact, actually just use 3D drafting processes. When you understand what BIM is, the implementation process required to get there makes more sense. People have a general understanding of BIM as an intelligent model-based process for planning, designing, building, and managing infrastructure. 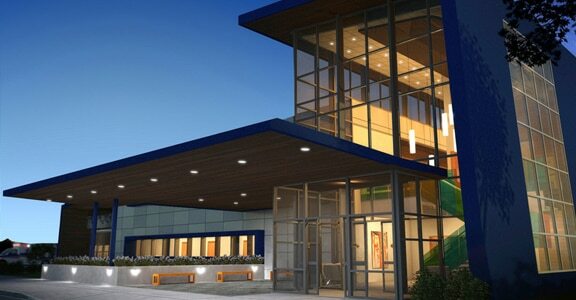 However, to implement BIM, you must ready yourself and your team to think differently about how projects are executed. You will no longer be working with points, lines, arcs, and shapes that represent objects. Instead, you will be creating and working with intelligent models. These models are spatially accurate and populated with intelligent objects. You begin by defining what these objects look like and how they should behave. Then you map a process that will help all project stakeholders get the most bene t from the intelligence within the model. Sounds too simple? Compared to the breadth of knowledge required to engineer even the least complex of your projects, implementing BIM is straightforward. It does require some planning, time, and training in the beginning to get started. The process outlined in this paper is a high-level look at the steps that you need to take to start executing projects using a BIM process. To understand what BIM is, it helps to understand what it isn’t. It’s more than just the next step in the evolution of 2D drafting or another way of referring to 3D design. Prior to the 1990s, civil infrastructure, buildings, and manufactured goods were designed, for the most part, using pencil and paper. Leonardo Di Vinci could have walked into a typical drafting department and understood the process. He might have marveled at how much pencils and paper had improved, but the basics of the drafting process would have been familiar. Drafting underwent a revolution as computer-aided drafting (CAD) transformed the way people created designs for everything from bridges to buildings to cars. Design processes got faster, and it became somewhat easier to communicate designs across a large team. But 2D lines, arcs, and circles still served as the language of design. a 3D transportation project looked similar to one on a 2D project. Each stage in the workflow—concept definition, environmental documentation, detailed design and plan development, construction planning, and as-built creation—involved little reuse or sharing of data. With 2D and 3D CAD, people re-create data at every stage of the process to serve a particular purpose. Though inefficient and error-prone, re-creating data is often necessary because unintelligent “data” cannot adapt to new purposes readily. Some 3D CAD technologies attempt to overcome the drawbacks of unintelligent data by letting designers add attributes to elements within a design. For instance, you could label every point in a design that signifies the location of a re hydrant, making it easier to count and locate hydrants in the design. However, each hydrant lacks the “awareness” that comes with intelligence. Hydrants don’t know if they meet the specifications for their location or if they are attached to the network following accepted standards. A 3D design with labels isn’t BIM; in many respects, it’s closer to traditional 2D design than to a true BIM process. BIM lets you work with intelligent objects within an intelligent model. This intelligence comes in the form of geometry definitions, relationships, and data that drive how the model reacts as it evolves. If an element changes, the entire model adjusts and coordinates the rest of the model to account for the changes dynamically. Unlike a 3D and database-driven design process, BIM data resides in the model; it’s not an attribute in an external database. So, the software can keep the entire design consistent and coordinated. BIM is about working in an entirely new way. The intelligence of a BIM model opens the door to new levels of efficiency. Say you’re designing an overpass using a BIM process. 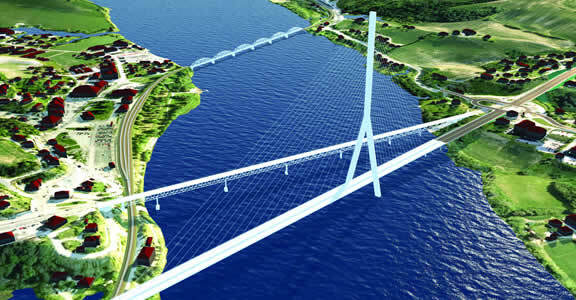 You design the structure that supports the overpass within the model. Each component of the structure, including embankments, piers, and railings, conforms to the specifications you set either within the model or that you select from a library of specifications for your region. The client asks for a change to a pro le. You modify the pro le and the change is reflected automatically throughout the design. You don’t have to manually change each component individually. As efficient as making changes becomes with BIM, the most striking advantages come from all that you—and an extended project team—can do with the information in the model. 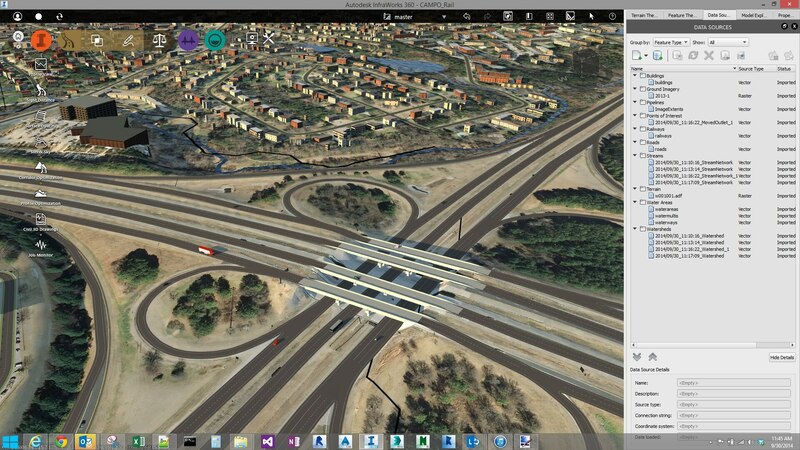 Imagine working from an intelligent 3D model of a project that contains all the transportation networks, utilities, open spaces, buildings, and infrastructure components. Select any street in the city. You immediately see its location, connecting streets, overhead and underground utilities, nearby buildings, and more. Such a model would make it easier to work on a project that affected the street; it also would improve any operations and maintenance planning in the area. 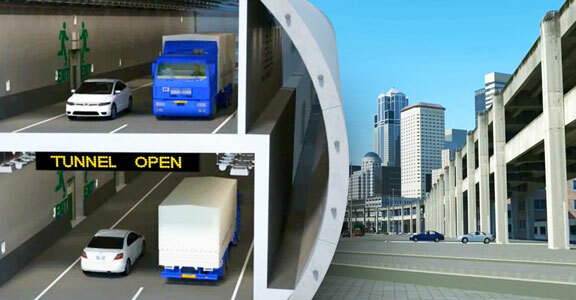 The city or other infrastructure owners could run simulations to better evaluate risk and enhance asset performance. They could also compare planning alternatives more easily within the context of existing conditions. Just as the way you work with data with BIM is different than with CAD, a BIM design process is different, too. The rest of this paper reviews some of those differences, and provides guidance to help account for them as you transition to BIM. When getting started with BIM for infrastructure, should you just dive in and change every aspect of the way you work at once? Or should you have a highly detailed plan that accounts for every step along the way? The first option will likely prove highly frustrating even if you include a training program for your team at the beginning. Your team won’t have a clear idea of your firm’s plan for getting to BIM or know what shared goals to strive for. The second option has its pitfalls, too. Some organizations actually over-plan for a BIM implementation. They know it’s important to have clear standards when implementing BIM, so they try to establish standards for everything they do before using BIM processes on a single project. 3D view showing pipes in a BIM model. The best approach is to start by thinking about what you, your clients, and the rest of the team will want to do with the model during development of the project. Also consider how the model could be used to manage assets once the project is built. Set high-level goals that support how the model actually will be used, and communicate those goals to the team. Note what key pieces of information, such as physical attributes, and relationships of objects within the model are important to achieve your goals. Then, you’ll be ready to begin defining the standards that will help you get started. You’ll need standards for all the objects you commonly use. The easiest way to get started is to begin with a library of BIM standards that match or are close to what you and your clients will need. You can modify the standards to better conform to your needs and preferences. For instance, Autodesk® AutoCAD® Civil 3D® software includes a library of standards for many types of civil infrastructure objects, such as gravity and pressure pipe networks and grading. Using drainage networks as our example, let’s review at a high level the object intelligence and attributes you’ll want to de ne as you implement BIM. Before diving into detail, it’s important to remember why defining standards in advance is so essential. With BIM, you design with objects—not lines, arcs, and shapes. Drainage elements, such as pipes, and drainage structures, such as manholes, are all objects in a larger model. A plan view of a project designed following a BIM process. When a pipe is placed in a model, it will be able to “suggest” its own characteristics based on design standards you’ve de ned and the location and characteristics of the other objects in the model. As mentioned earlier, you can save time by starting with predefined BIM standards that match or are close to the standards you follow. Prior to getting started with your project, edit the definitions for all major elements in the network to the exact standards you use. Since plan sets are still a common required deliverable, be sure to de ne how you want each object to look when printed in construction documents. Very often, these preferences are quite distinctive to an individual organization and geography. Defining your own printing standards ensures that work performed using BIM processes also maintains your organization’s “look” in documentation. With drainage networks, you’ll want to de ne objects such as inlets, manhole covers, and pipes. For each, consider the materials you want to specify. Will the pipes be plastic, metal, or concrete? Align any predefined materials standards within your BIM tools to match your preferred specifications. Just as importantly, you’ll have to define the criteria that control the behavior of objects. The predefined standards likely will cover many common criteria, such as pipe size and thickness. Other criteria will be more distinctive to your region or your way of working. Thoroughly defined criteria will save you significant time down the road. 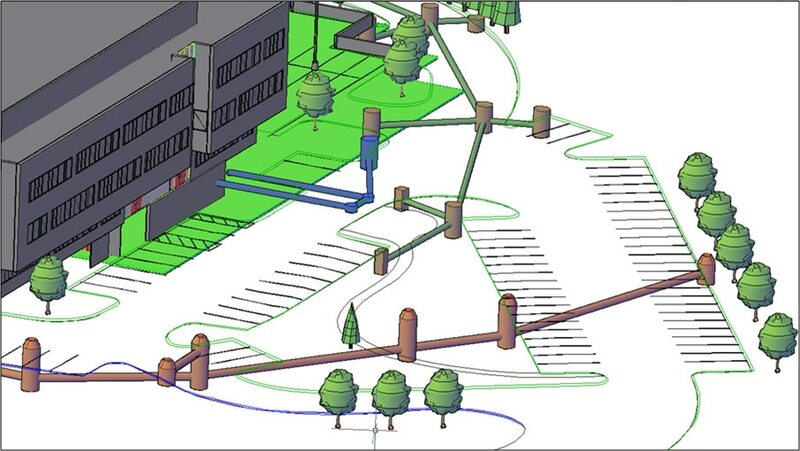 For instance, when you de ne the minimum separation between storm sewer pipes and other utilities, your BIM tools will help you maintain that distance throughout the project automatically. To begin using BIM on an infrastructure project, you start by creating an intelligent existing conditions model that can help accelerate the pace of your entire project. Contrast that with traditional conditions drawings, which often lack enough detail and depth to contribute to later phases of projects. In a BIM process, an existing conditions model will be 3D, spatially accurate and data-rich—not just 2D or 2D elements displayed with 3D effects. You set yourself up for success by gathering all the data you need, and then assigning the correct object intelligence to elements within the model. A BIM process lets you explore projects in the context of existing conditions more easily. Data in many of the most common spatial data formats can be incorporated into your model with no need for conversion. The objects within the model have attributes that make them more intelligent. 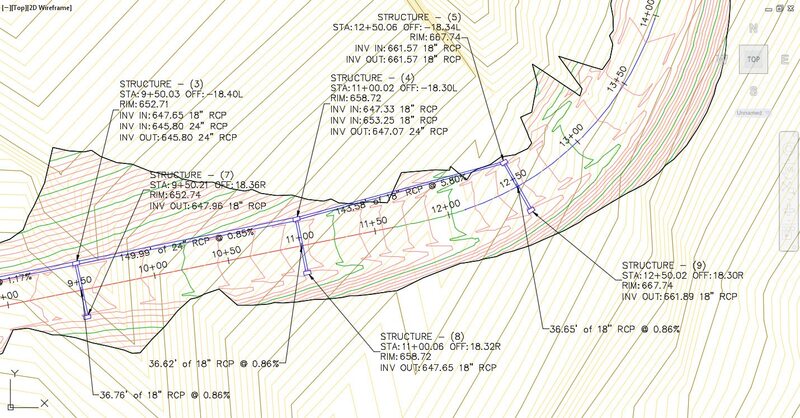 For instance, a pipe looks like a pipe in your 3D model. The pipe will also have a diameter, depth below ground, and a relationship with other objects within the model. This is unlike what you may be used to in traditional CAD-based preliminary design, where you see elements like utilities as a 2D layer that lacks a de ned relationship to items depicted in other layers. At this preliminary stage, you can more quickly add model elements. In a relatively short span of time, you can create and evaluate multiple alternatives and present different options more effectively within the context of existing conditions to project decision makers. By extending your model to the cloud, you can make it available on mobile devices in the field. You can explore the proposed project site with decision makers, who will be able to view the proposed alternatives more effectively in the context of actual conditions. Decision makers see their options in a visually rich context, helping them to make more informed choices. After they make their decisions, you can bring the preliminary model into AutoCAD Civil 3D. The software will recognize the objects in the model. By applying your predefined standards to the objects, you add detail and more intelligence to the model automatically. This is an example of how you bene t from the effort you put into defining your standards. You can save more time on virtually every subsequent project that uses the same standards. To implement BIM effectively, you’ll want to create a project execution plan. For smaller projects, such a plan might be fairly simple. On a large project with many stakeholders, a highly detailed plan may be necessary to keep everyone pointed in the same direction. Why do you always need a plan? With BIM, you design with intelligent objects. You need to know what intelligence the objects should have from the start of the project. Also, when you share designs that are based on intelligent objects, a change can ripple through the whole design. Will the model be used for fabrication in addition to documentation? How will the model be used in construction? What else can I use the model for? Analysis, simulation, optimization? What have I always wanted to do that I couldn’t with 2D or 3D CAD-based design approaches? When and how will we share data with other disciplines on the project? Daily? Weekly? Monthly? How frequently should we coordinate models contributing to the project? Having a well-defined plan will help keep your team on track as they master BIM. Consider enhancing your project plan with a process for capturing and sharing milestones in the BIM implementation process. When your team sees and shares the benefits of BIM, it will be easier for them to appreciate the work they put into defining standards and processes up front. For instance, the first time an engineer moves a pro le and the related model elements and subsequent documentation updates automatically can be a transformative moment. No matter how much you understand and read about BIM, it’s those “aha moments” that drive home why the industry is moving to using intelligent models. Set yourself up for a winning transition to BIM. Start by establishing the standards and technology necessary to get started. Enable your team with training and achievable goals. Then, develop coordination and management workflows. Finally, ensure you capture and share knowledge gained on the project. You don’t have to go it alone. Autodesk and your Autodesk reseller can help you get to BIM—while helping you avoid pitfalls along the way. 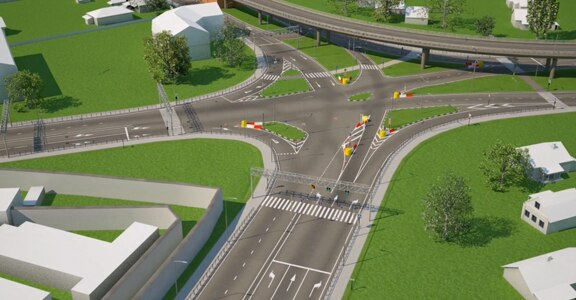 Learn more about how BIM can help with your civil infrastructure project. Autodesk, the Autodesk logo, AutoCAD, Civil 3D, and InfraWorks 360 are registered trademarks or trademarks of Autodesk, Inc., and/or its subsidiaries and/or affiliates in the USA and/or other countries. All other brand names, product names, or trademarks belong to their respective holders. Autodesk reserves the right to alter product and services offerings, and specifications and pricing at any time without notice, and is not responsible for typographical or graphical errors that may appear in this document. Help improve coordination among stakeholders to gain better insight and improve above and below- ground design decisions. Exploring design alternatives and visualizations in existing environments helped to better understand the plans to make decisions earlier than usually possible. 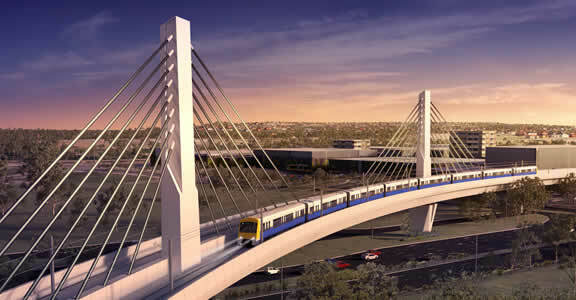 BIM helps SMEC win and deliver AU$8.3 billion public transit design project connecting teams in ways not possible with 2D design. A high-level look at the steps that you need to take to start executing projects using a BIM process.